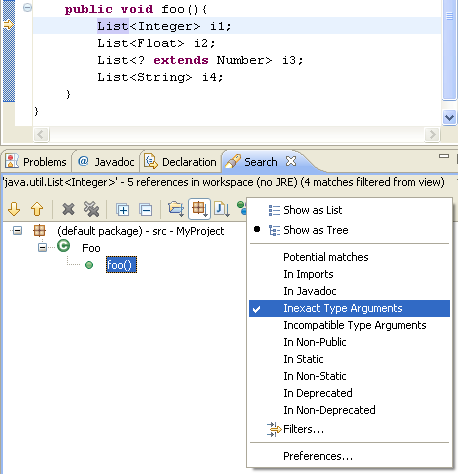 Since release 3.1, Eclipse includes full support for the new Java language features of J2SE 5.0. One of the most important consequences of this support is that you may not notice it at all--everything you expect to work for J2SE 1.4, including editing, compiling, debugging, quick fixes, refactorings, source actions, searching, etc., will work seamlessly with J2SE 5.0's new types and syntax. 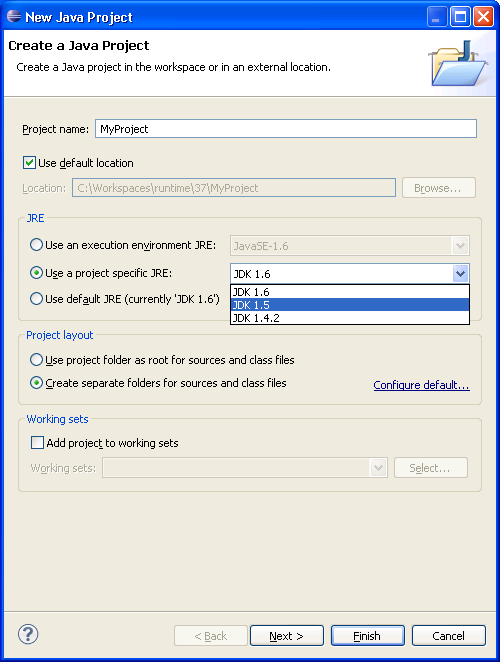 In this document, we will introduce some of the more interesting capabilities Eclipse users will find when working with J2SE 5.0. Note that both version numbers '1.5' and '5.0' are used to identify the release of the Java 2 Platform Standard Edition. Version '5.0' is the product version, while '1.5' is the developer version and is also used for the compliance level. In order to develop code compliant with J2SE 5.0, you will need a J2SE 5.0 or J2SE 6.0 Java Runtime Environment (JRE). If you start Eclipse for the first time using a J2SE 5.0 JRE, then it will use it by default. 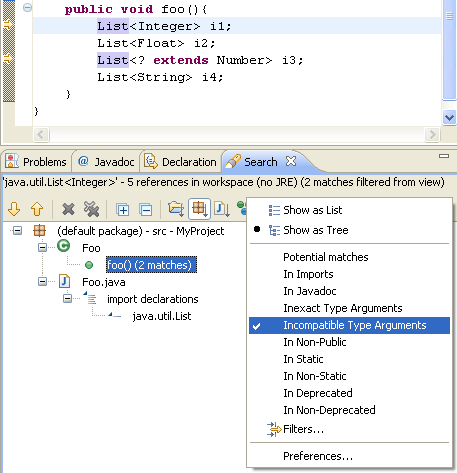 Otherwise, you will need to use the Java > Installed JREs preference page to register it with Eclipse. This document introduces some of the new language features in J2SE 5.0 very briefly, but it is not a proper tutorial for these features. See here for more information. Make sure you have a J2SE 5.0 JRE installed. Start using the 5.0 features in your code. 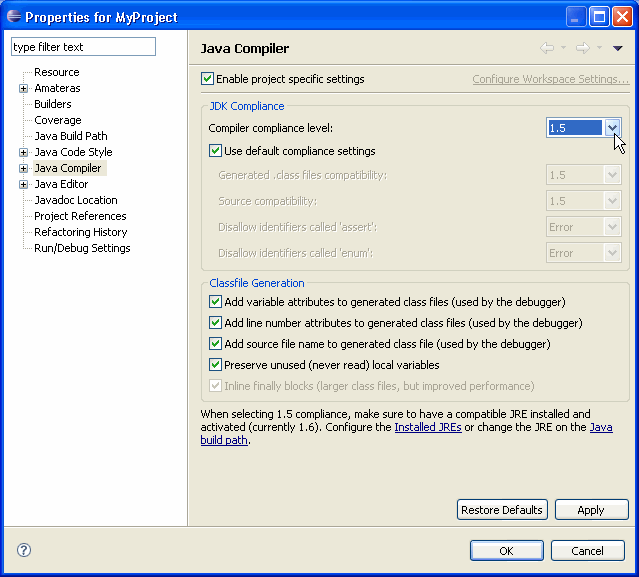 For more fine-tuned control, the compiler compliance level can be set globally for a workspace (with the Java > Compiler preference page) or individually for each project (from the project's context menu, choose Properties > Java Compiler). Projects with different compliance levels can co-exist in the workspace, and depend on each other. You can also fine-tune the kinds of compile warnings and errors produced for each project using Properties > Java Compiler > Errors/Warnings. 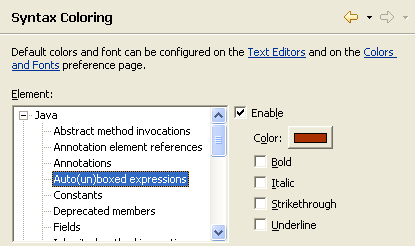 The Generic Types and the Annotations section contain options added for J2SE 5.0. Generic types allow objects of the same class to safely operate on objects of different types. For example, they allow compile-time assurances that a List<String> always contains Strings, and a List<Integer> always contains Integers. Generic types can be safely renamed. Type variables can be safely renamed. Generic methods can be safely extracted from / inlined into generic code. Code assist can automatically insert appropriate type parameters in parameterized types. 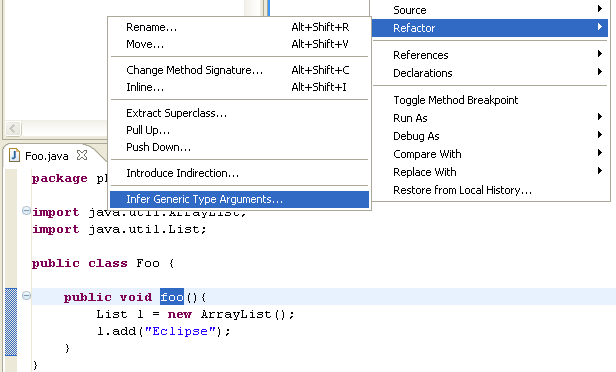 In addition, a new refactoring has been added: Infer Generic Type Arguments can infer type parameters for every type reference in a class, a package, or an entire project. Refactor: rename, move, change signatures of members, etc. Refactor: rename, move, rename constants, etc. Eclipse also provides a "Convert to enhanced for loop" quick-assist to upgrade 1.4-style for loops where possible. Static imports allow you to use static fields and methods from other classes without qualification. 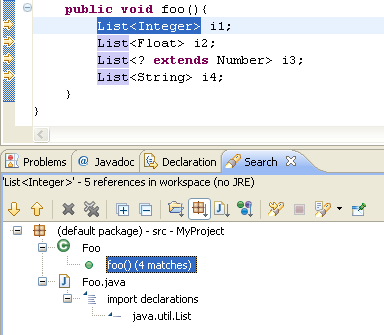 Content assist in the Java editor can suggest such static members and adds a static import when required. To get such proposals, configure the static import favorites on the Java > Editor > Content Assist > Favorites preference page.